In Digging Through the Greats, Green Label invites a visionary photographer, filmmaker, designer or artist to dig through their folios and tell the story of their favorite works. This is: Spencer Gillespie, director of our new documentary Guereirro: The Tiago Lemos Story. I got into filmmaking through skate videos, when I was in around the eighth grade. It was just me and my friends skating around Minneapolis and being bored teenagers, basically. It was my dad’s camera and we edited in iMovie. This was before YouTube—we’d burn them onto DVDs. I do a skate blog called Village Psychic, which I do a lot of video content for. I try and not focus on California skateboarding because it’s just kind of oversaturated. Like, everyone knows what’s going on there. I’m from Minneapolis, so I focus a lot on Minneapolis skateboarding cause I think there’s some really cool stuff there and not a lot of people know about it. Every magazine is based in California and every company is based in California, so to get a fresh look at that stuff is really important. I mean, with the Internet, it’s totally different now, but you don’t see that as much. There’s a lot of really cool stuff in Europe that people wouldn’t know about five years ago, so I think that stuff is important to share with people. A lot of people will submit stuff to us just because we have a big YouTube following. We do these vintage wear tests that I really like and people react really well to. We get shoes from the ’90s off eBay and then we have dudes test them out. My personal favorite is the Josh Kalis DC. I had like, three of them when I was a kid. That’s really why we started doing these: ’cause everyone’s always like, “Oh, remember? That was the sickest shoe ever!” But it wasn’t. They all sucked. You just remember them in a certain light. At first you make skate videos for fun. Then you make videos that you want other people to watch. And then, for me, it went back to making them for fun; once you realize that you and your friends are not great at skating, you just make them for yourself again. And that’s kind of a good thing. So, we went to Tulio’s Park in Campinas and we didn’t end up using any of the footage, but we were just skating with Wilton and Tiago. Tulio’s a former pro in the United States and he moved back to Brazil and just runs this now. I guess something kind of cool about filming with Tiago would be that he’s really, really good at skating, [laughs]. Obviously. But I don’t think he realizes it. Like, we would put the camera down and then he would start trying crazy stuff and we would be like, “Oh. We can’t stop filming, really.” Like, we were just literally hanging out and eating pizza, and I was like, “Kickflip the bump to bump. I want to get a photo.” And then he just started going all the way to the flat, like for no reason. This was really crazy. Wilton and Tiago just did a million tricks down the double side. Just over and over. This was just like a ledge spot before, and I think they just kind of realized that the skateboarders weren’t gonna go away so they turned it into a ramp. It was really fun. It was a good park. It’s really narrow. If there was multiple people in there, I think it would get crowded fast, but this plaza was pretty sweet. It’s like a super famous skate plaza, and there was one guy, Marcelo, who grew up on the street and he’s a relatively famous Brazilian skateboarder. So he kind of knew everyone that hangs out there. It’s a pretty rough area of Sao Paulo, and he kind of gives you the pass to skate there.Tiago and him are friends, just through skateboarding. Our security guards I could tell were really nervous. They didn’t talk about why we should be worried, but you could just tell that was not an area they were used to—young, foreigners with cameras going. I think it made them way more uncomfortable than it made Zach [Cooper, co-director] and I, for sure. But yeah, that was really cool. It was kind of a, kind of culture shock over there. More so than the rest of Sao Paulo is. Like the people that were hanging out in this area were extremely poor. But I don’t know. I didn’t really know what I was expecting Sao Paulo to be like, but I really wasn’t—maybe this is me just being ignorant—but I didn’t feel like I was in danger. We kind of mention it in the movie, but all the ground is Portuguese rock, which these dudes can just skate; I was trying to skate it and couldn’t even roll. 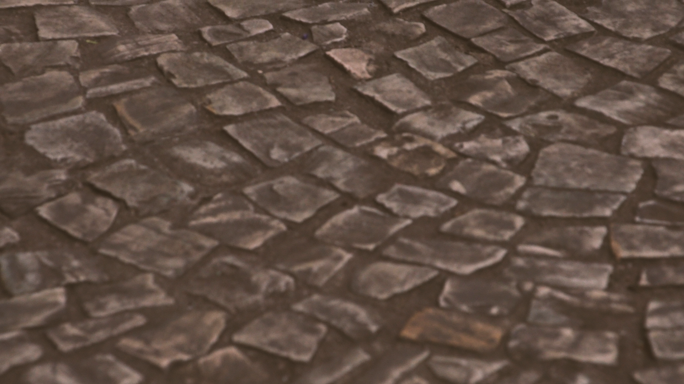 It’s just a character of Portuguese architecture, like broken stones that they cement together, and it looks really beautiful but it’s impossible to skate on. He’s doing tricks on it, which is insane. People always talk about how skateboarders from the East Coast will go to California where the ground is perfect so they can skate it with no problem, and I think that’s kind of the same thing that happens with Brazilians. They’re used to skating on so much rough ground that they’ll go to California and it feels like a skatepark. It’s kind of funny to go to a skate park and a normal session is just 20 dudes you recognize from videos and magazines. John Dixon was there. I’d never seen him before. Chad Tim Tim, Levi Brown, Jonny Layton, and then like the entire Boulevard team, which we were with. But it was still fun to see them skating. I think all the Boulevard guys live around there, and Rodrigo lives there. We didn’t really talk about it a ton in the documentary, but Rodrigo is really, really good about bringing in younger generations of Brazilians and helping them get accustomed to the United States and what the culture is like. ‘Cause when you’re coming from Brazil, it’s very, very different. Tiago is like learning English right now. He didn’t move here speaking English, he’s learning it, so I think it really helps having an older guy who’s essentially done with what he’ doing right now. This is another former street spot turned into a skate park, and that was our first day with Tiago. That was my first time seeing him skate in person, and he did the most insane, never-been-done [tricks] at the spot, which was really crazy to see. He did a fakie manny fakie heel. Then he just totally destroyed the spot. It was really crazy. Rodrigo was like, “Hey, it’s Tiago’s birthday tonight. We’re going to surprise him with boards at JKwon. You guys should go.” Skateboarding is weird because even if you’re not a professional, you’re probably making money from it, you know? But to go pro and have your name on a board is still like a really, really big deal. I feel like most people who skateboard have gone through a period of their life where that is a dream of theirs. We went and we hooked JKwon up with generators and light, were just skating around and having fun. It was just a night session basically, and then they surprised Tiago and Carlos with their boards, and it was a really, really special moment. Check out more at greenlabel.com/tiagolemos. RELATED:TRAILER FOR ‘LAST DAYS OF JKWON’.